Little blue penguins are the smallest species of penguin in the world. When visitors step up to their exhibit across from the Gift Shop, many exclaim, "Aww, look at the babies!" Except they're not babies. 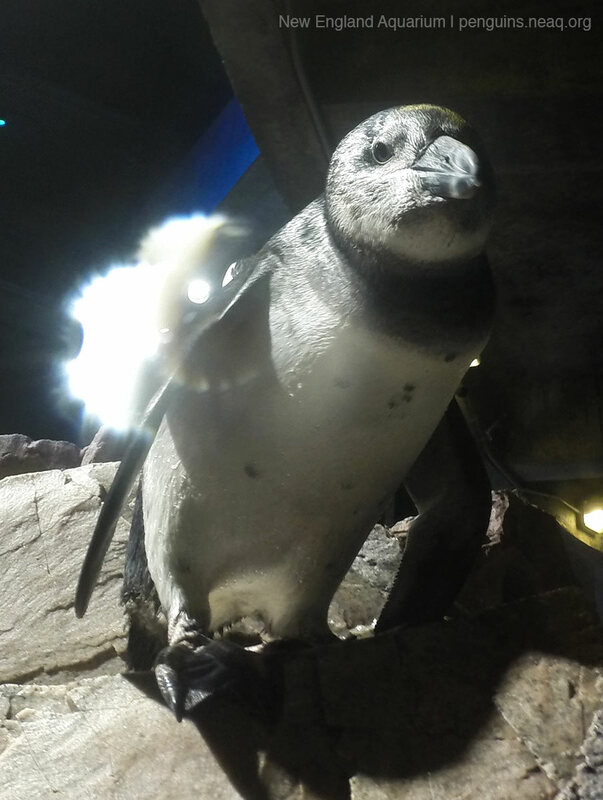 While they are petite and noticeably smaller than their African and rockhopper neighbors, the birds on exhibit are not babies. BUT! This spring, the babies weren't far. 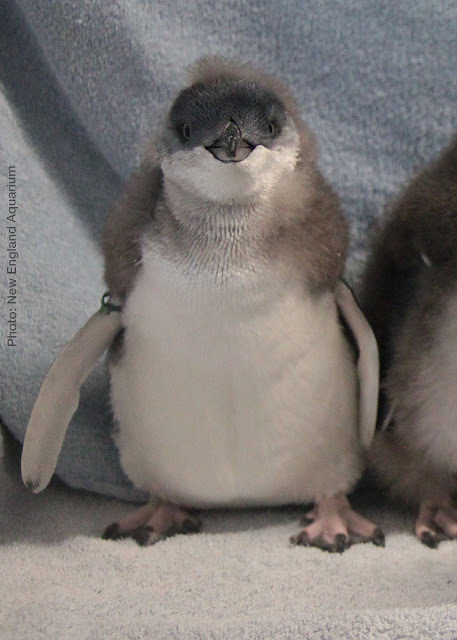 We're thrilled to share that five little blue chicks hatched earlier this year and have been growing up behind the scenes in the comfort and safety of their parents' watchful eyes (with a little help from our penguin team). 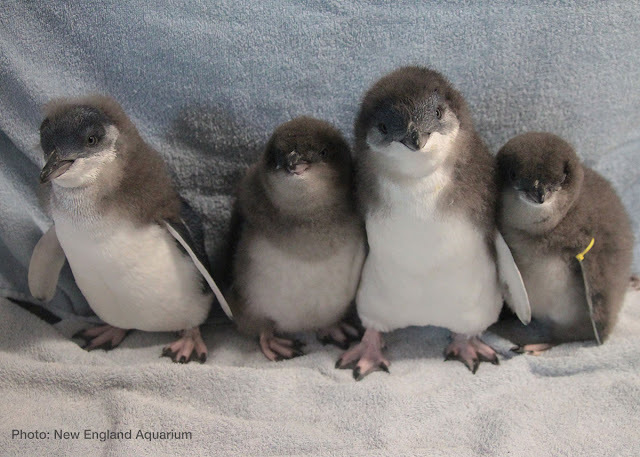 Four of the five little blue penguins born at the Aquarium this year. The chicks hatched from their eggs around April. Two of the little ones made their media debuts just before Mother’s Day in a video celebrating mothers around the world, including their own. In fact, their mom, 9-year-old Carnac was also hatched here in Boston. She is an experienced mom having raised three other chicks before. Now it's time for others to shine! 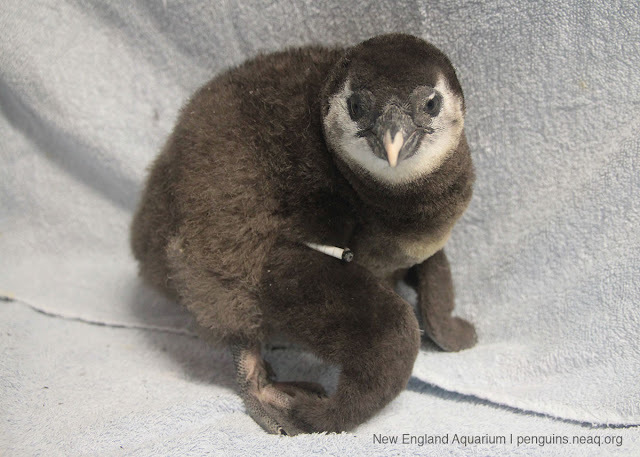 This year's chicks are in various stages of development, one is still poofed out in its downy gray feathers, the rest have grown their handsome blue and white waterproof feathers and have already joined the adults on exhibit! The little one will remain behind the scenes with its parents while it matures. So while you can visit these newbies on exhibit, we're pretty sure you'll still want to see their baby pictures. Brace yourself, this is some serious cute. Few things are cuter than a fluffy jumble of penguin chicks. 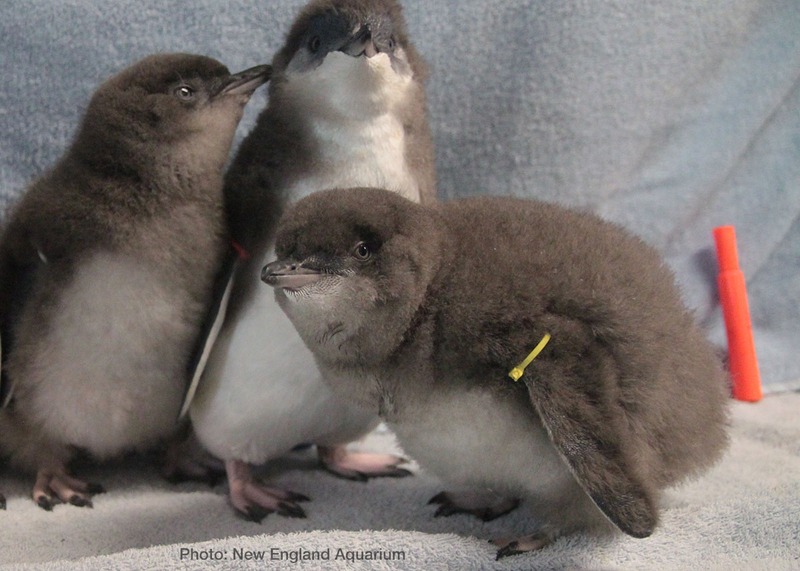 The chicks wear temporary ID bracelets on their wings so the penguin biologists can tell them apart. 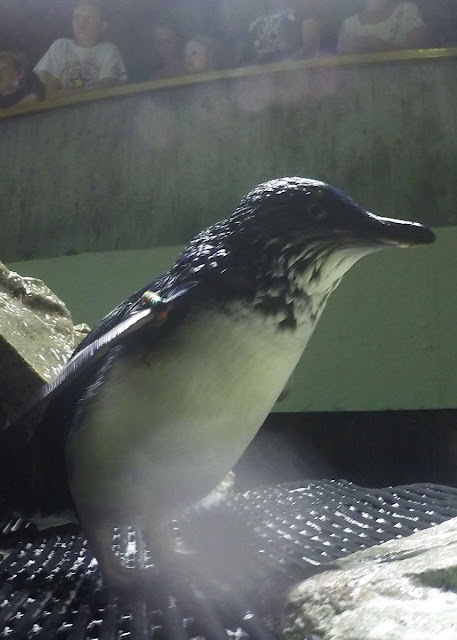 They may be small, but little blue penguins can make a racket! These little blues are sporting the downy feathers of a younger chick. you can see its white belly and lovely blueish feathers growing in. Find more cute pictures of these little chicks in the Boston Herald. 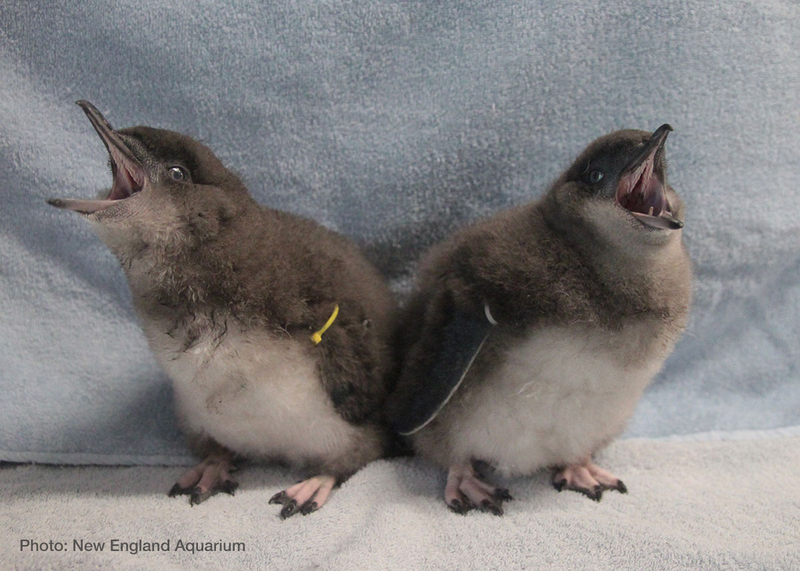 Earlier this summer we shared the happy news that several penguin chicks hatched here at the Aquarium. They made their fluffy media debut in June behind the scenes. 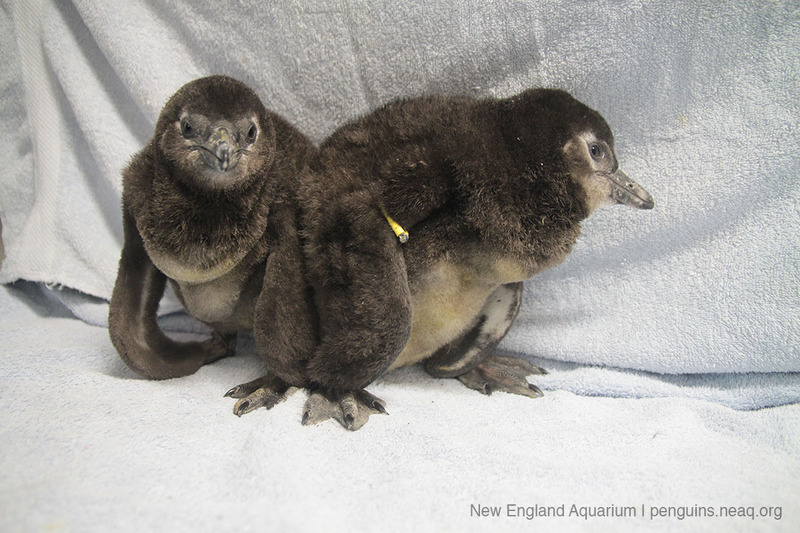 We're excited to announce that these chicks have grown up nicely and are now on exhibit! So, some introductions are in order. 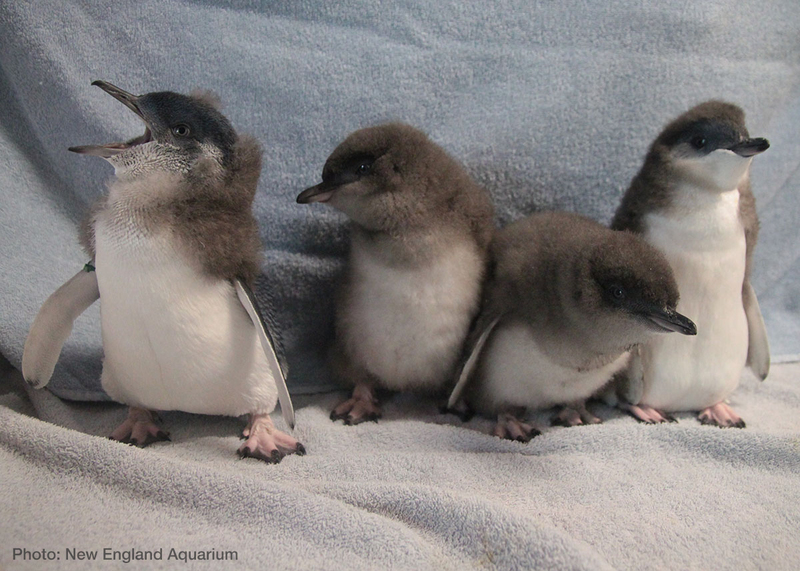 Here are the newest additions to the penguin colony. 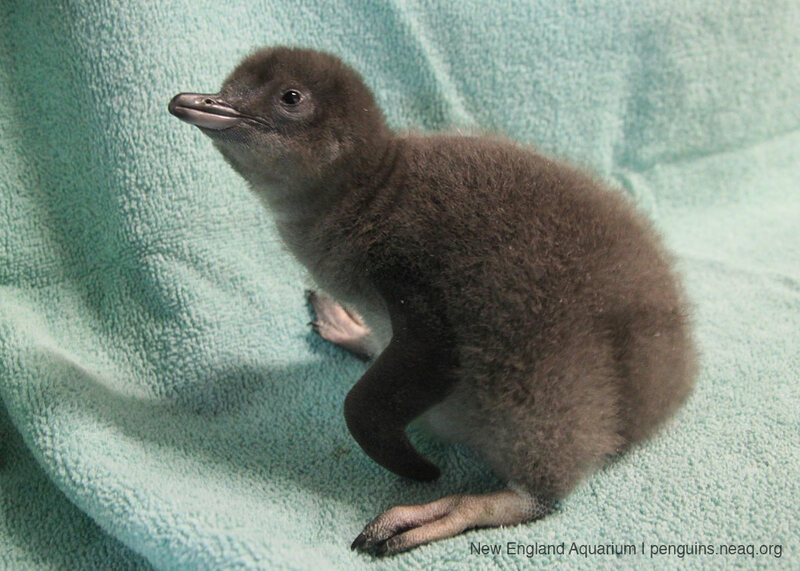 Fox is the newest little blue penguin. Fox is a little blue penguin. She wears a red and green bracelet on her right wing. She has been on exhibit since the end of May and is doing great. She was born on March 31, 2015. Her parents are Montague and Kikiyu. We gave her the name Fox because foxes are an introduced predator to little blues and can be detrimental to their populations. The population of little blues on Middle Island in Australia was over 600 birds in the year 2000, by 2005 it was down to only 10 and this was largely due to predation from foxes that made it to the island. They have since solved the fox problem and the numbers are growing again. Albatross at 41 days old, see the white markings? Albatross is named after Albatross Island in Namibia it was formally a large penguin breeding colony but has now become a large fur seal colony. When you look at the photos of Albatross you will notice he has very distinctive white spots on his beak and eyelids. He was born like this, we are not sure if his beak will change and get darker as he gets older. But it makes him very easy to spot on exhibit. 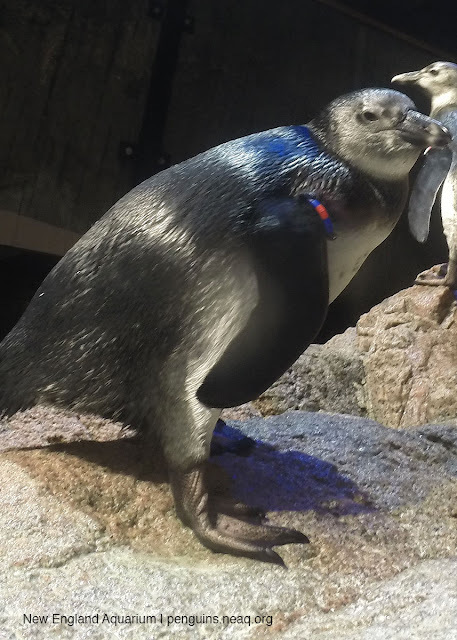 Pilchard the African penguin is wearing a red and blue bracelet on her right wing (pending DNA results, females wear the bracelet on the right). She was born on May 13, 2015. Her parents are also Mercury and Saldahna. Pilchard is a type of fish African penguins feed on. 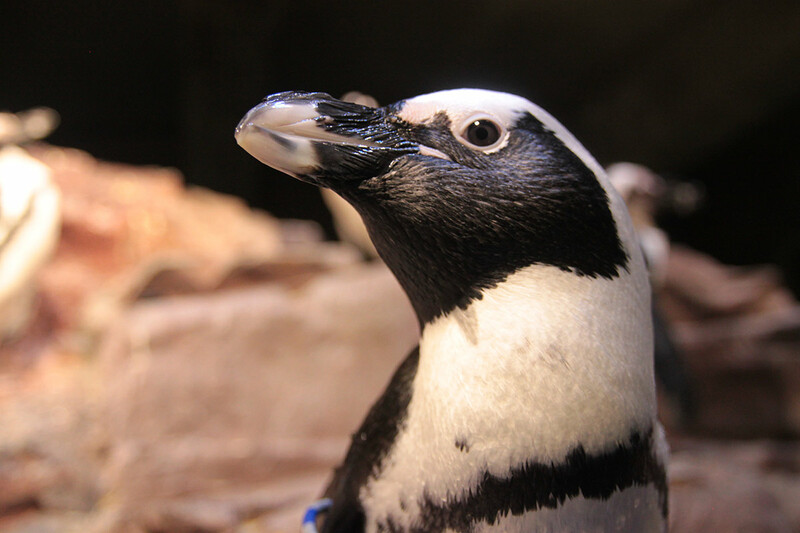 Recent declines in the pilchard population is one of the factors that have caused the African penguin population to decline making them endangered. 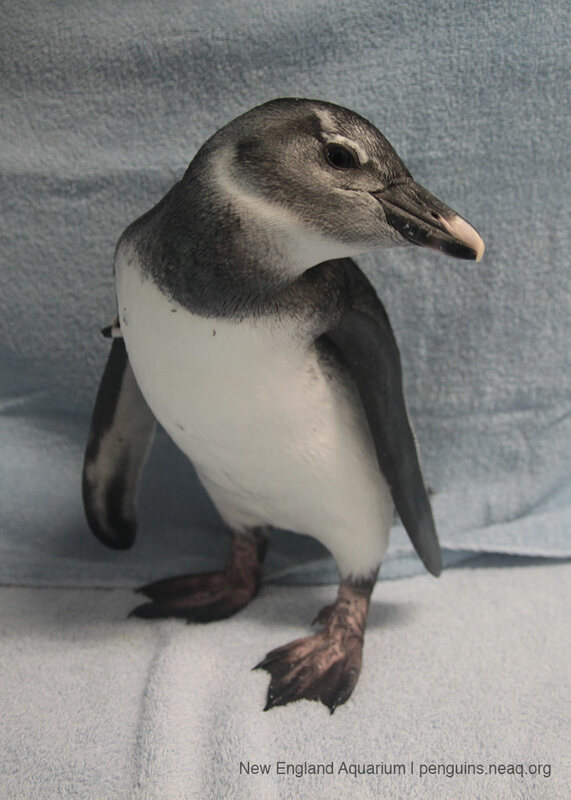 The African penguin chicks still sport their juvenile plumage. All have been on exhibit for a couple weeks now and are doing quite well. 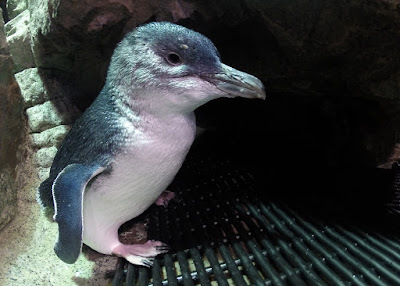 Come visit the new African and little blue penguins at Aquarium soon and get to know these newest members of our colony! Dr. Jessica Kemper is an expert and advocate for the endangered African penguin. 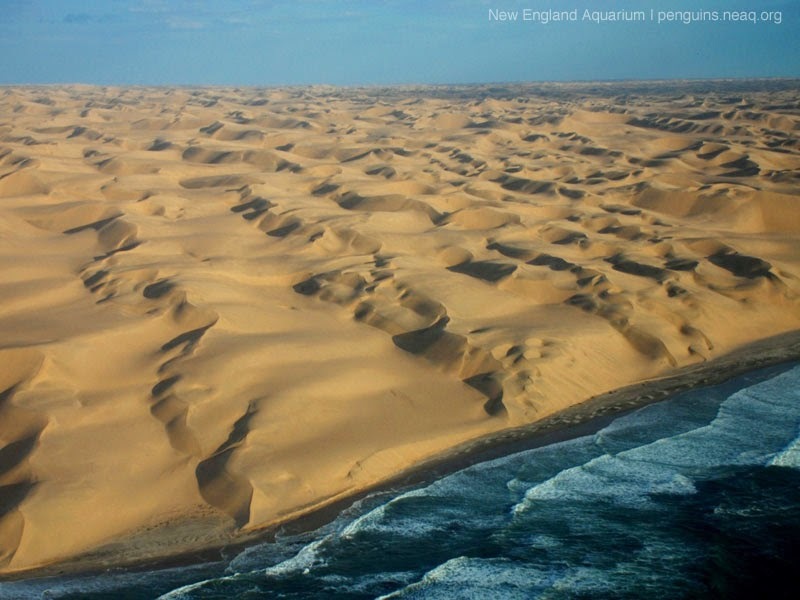 In this series of posts, she describes a unique resupply mission to help rescued African penguin chicks being hand-raised in Namibia. Read Part 1, which ended with the rehabilitation team asking for help getting food for the young chicks in their care. In Part 2, Jessica springs into action! Keep reading for the exciting conclusion. 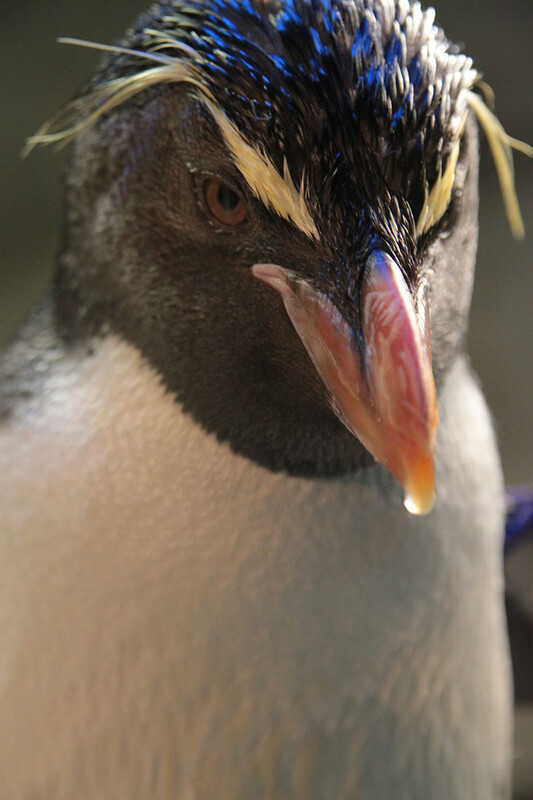 And make plans to see penguins in person here at the Aquarium—we have more than 80 birds on exhibit! Gino’s voice sounds far away through my headphones. “I’m going to first fly a loop past the island so we can check out the best way to do this. Don’t want to bludgeon any birds or the two small solar panels next to the house with our fish bricks, so we need to find an open space near the building to aim the parcels at.” Gino slows down the plane and we discuss our strategy. 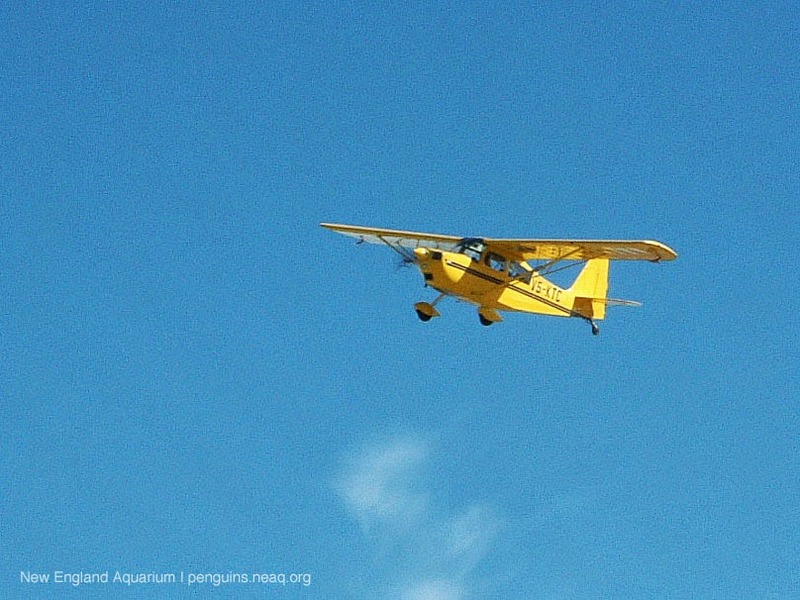 The yellow plane: Kilo-Tango-Charlie, Gino’s canary-yellow Citabria. Okay, here goes. Our first fly-past. Gino opens his window, I hand him the first parcel and hold my breath. NOW! Gino throws it out of the window and immediately pulls the plane into a steep left-hand bank, away from the island. “Can you see where it landed?” he shouts. “Spot-on Gino. It landed next to the balcony!! !” I can see Joan and Rian hopping up and down, giving us the thumbs-up. Four more fly-pasts later (one parcel went into the sea but the rest landed where they were supposed to) we are on our way home. 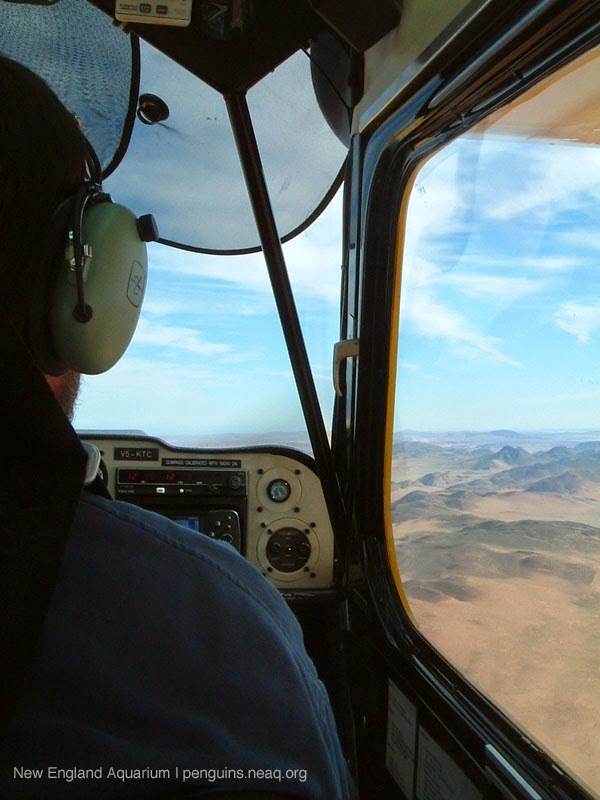 The desert below us is glowing gold in the late afternoon light and we chat cheerfully all the way back to the Lüderitz airfield. It is dark by the time we have parked Gino’s plane in its shed and are back in town. The phone rings. “Please do not hang up…this call is from a radio…do not speak until after the tone…beeeeeep.” Static crackles over the line. “Jessica, it’s Joan, can you hear me? I just wanted to let you know that we currently have five very content chicks with full bellies sitting in our kitchen; thank you so much – over.” When I hang up the phone I smile. I certainly don’t want to do this again in a hurry, but it had all been worth it. the company of thousands of birds outside the lounge window. PS: these events took place on March 26, 2003. The vessel servicing the islands was repaired a few days after our rescue flight and delivered lots of frozen sardines to the island. The four penguin chicks and Katanga the Cape gannet chick all fledged successfully. 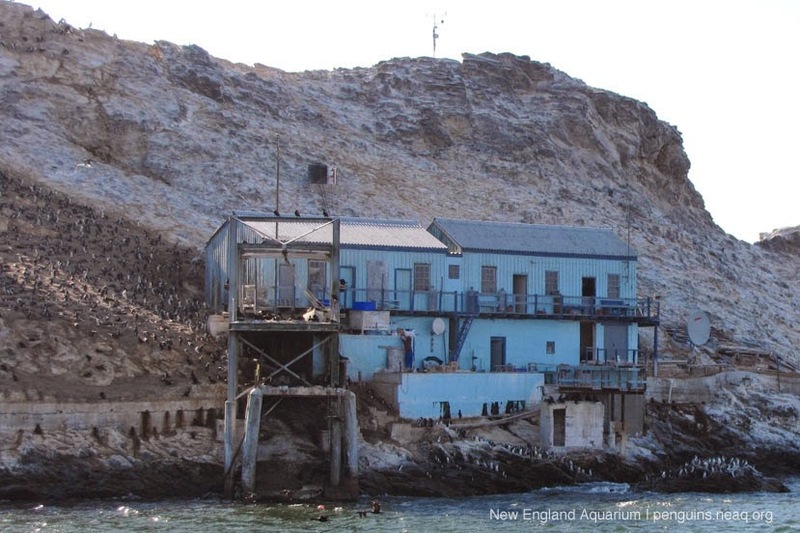 Rian still lives on Mercury Island and monitors the seabird populations there. 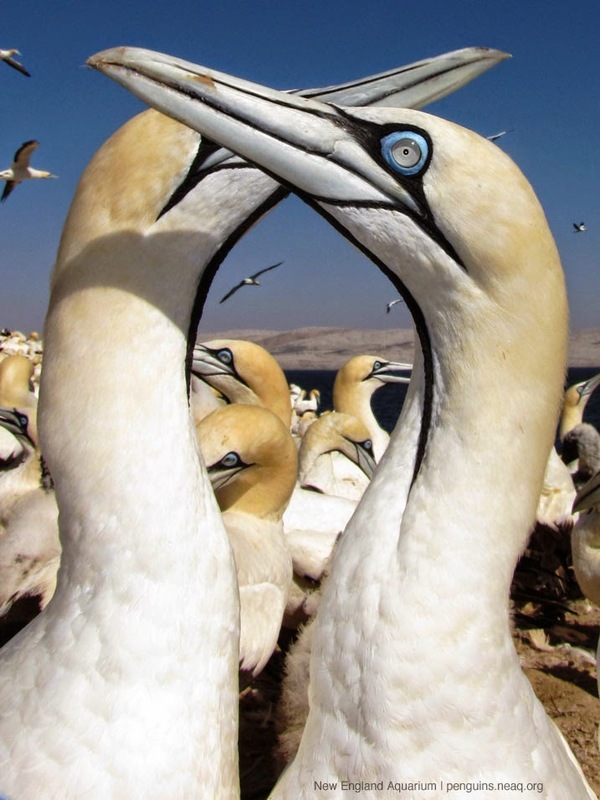 Cape gannets: Mercury supports the northernmost of only six Cape gannet colonies in the world. Their numbers have dwindled drastically in Namibia and they are now considered “critically endangered” there. Read all of her guests posts on the Penguin Blog here. 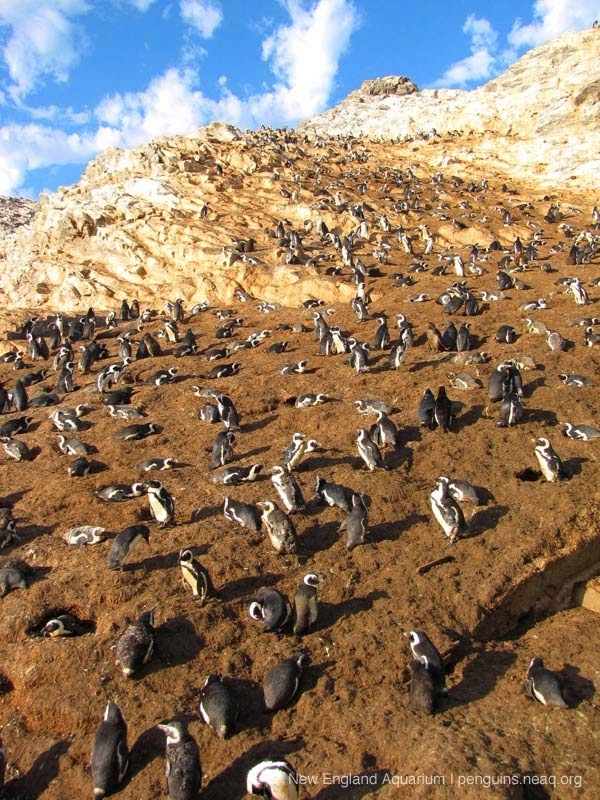 In this series of posts, she describes a unique resupply mission to help rescued African penguin chicks being hand-raised in Namibia. Read Part 1, which ended with the rehabilitation team asking for help getting food for the young chicks in their care. Oh no, what a predicament. It takes eight hours by boat to reach Mercury Island from the small harbor town of Lüderitz; there is no way we could find a boat willing to take a few boxes of frozen sardine that far and at such short notice. Never mind that it would cost an arm and a leg. And getting there by land through the extensive dune fields is definitely not an option either. Well, at least it is one of these rare days with perfect weather. No howling wind, no fog. I phone my friend Gino - a conservationist and keen aviator - and discuss my (admittedly rather bizarre) idea of doing a “Mercury-Island-fly-past-sardine-drop” with him. I know it’s a long shot, but Gino is enthusiastic and we immediately start planning our airdrop mission. I call Joan and Rian; they are excited but not entirely convinced that this would work. Two hours later we are in the air in Gino’s bright yellow two-seater Citabria. I am firmly wedged into the narrow back seat, balancing five parcels made of tightly wrapped frozen sardine on my lap. Nearly an hour after take-off we can see the island, and as we get closer we spot Joan and Rian waving from the balcony of their house. Stay tuned to for the conclusion to this series of posts: The day it rained sardines in Namibia!